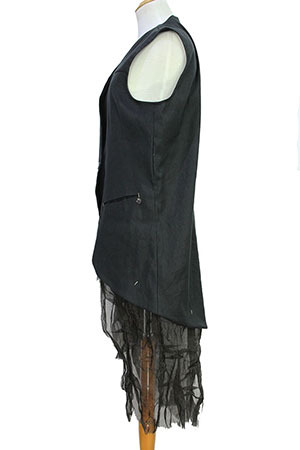 Nostrasantissima long gilet in black linen mix. Collarless. Single button fastening. 2 pockets with stitch details. Cut-away style with rounded hem extending lower at the rear, very elegant, rather like a tailcoat. 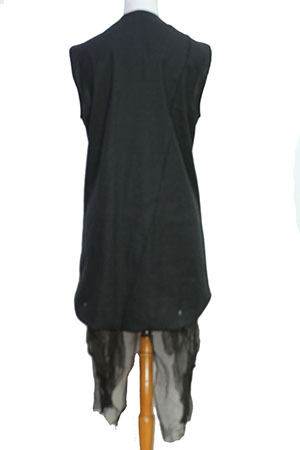 The curved hem at the sides and rear is doubled fabric and there is a fine, cotton and metal fabric frill attached extending down at each side. The is a very special piece of clothing, highly recommended!